I think tablescapes should tell stories. AND I think the best way to tell a story is by pulling from the past and the present. 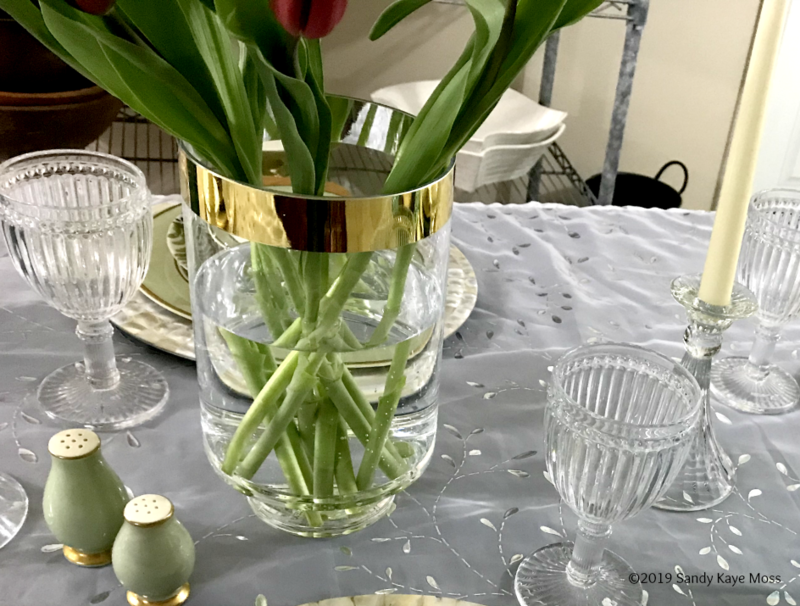 Creating a simple spring tablescape tells two stories. One… spring is finally here! Two… It’s time to use lighter colors. We actually don’t have a dining room in this home. Our kitchen table does pretty much everything. Including being a sub-desk for hubby’s computer. Our kitchen table is one of the coolest finds. We picked it in a small town in Ohio, Nelsonville. There is a cute lil soap shop there and the owner was giving it away. It’s actually a conference table that was either in a bank or an attorney’s office. Can’t remember exactly what the owner said. It is perfect for us though! And of course it makes my semi BOHO ♥ just sing!! So… Here is a quick visual of how this tablescape came together. We have inherited quite a few pieces from Hubby’s family. The dinner plates, small bowls and salt and pepper are part of our set from his grandmother. The Carnival Ware candy dish was his great grandmother’s but he can’t remember! Too funny!! I think mixing vintage or personal pieces with new ones can allow both to take on new meaning. Sometimes if only the personal, older pieces are used the statement can feel dated. OR… if only new pieces are put out it can feel almost cold and contrived. BUT this is totally personal!! I’m sure in the future I will do both!! Some of the new-ish goodies in this table story are the gold trimmed vase, cake stand, glasses and napkins. I locked eyes on that vase almost the minute I walked into the TJ Maxx home section. Target and TJ Maxx are my two favorite spots for finding unique vases. 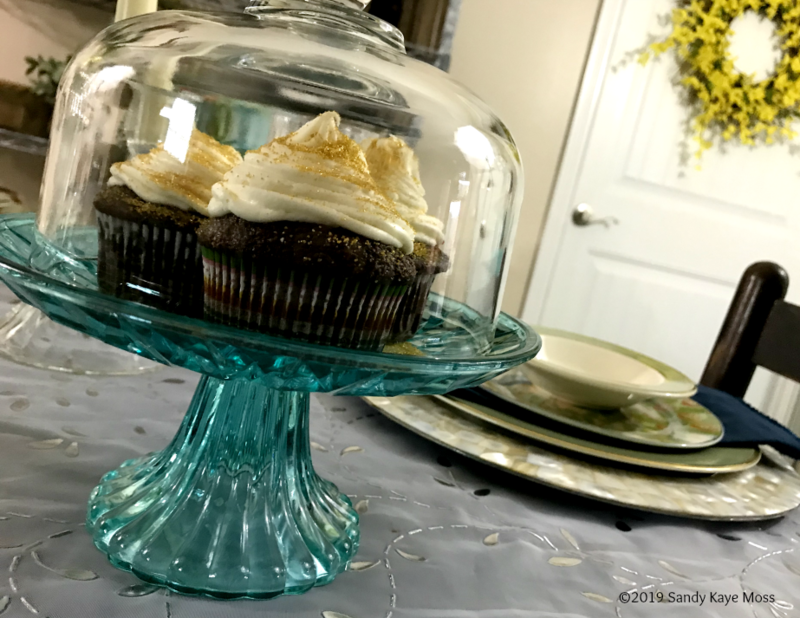 The blue cake stand came from the Target Dollar Spot… Wild isn’t it!!?? It was just the stand but I had the glass top thingy from another piece I found and it fit perfectly. The table covering is also a TJ MAXX find. Actually, there are two. Well… I know weird. BUT the covering is this super cool pair of window shears. The pattern just grabbed me when I walked by on afternoon when hubby and I were goofing off. I could NOT get them outta my brain. Of course, I went back the next day! They were STILL there! WOOHOO. I already KNOW I will be using these more in the future. The glasses, napkins and chargers are from Pier 1. I like to mix it up with the napkins… of course… I mean, more color right?! The glass candle holders came from Hobby Lobby, I think, but honestly, I can’t remember. I’ve had them forever. What I especially like about this entire tablescape is how it sparkles. The gold rim on the dinner plates is repeated on the vase and the chargers. The sparkle in the pattern on the table covering bounces off the stem ware and the chargers and the light dances between the water in the vase and the candle holders. So. 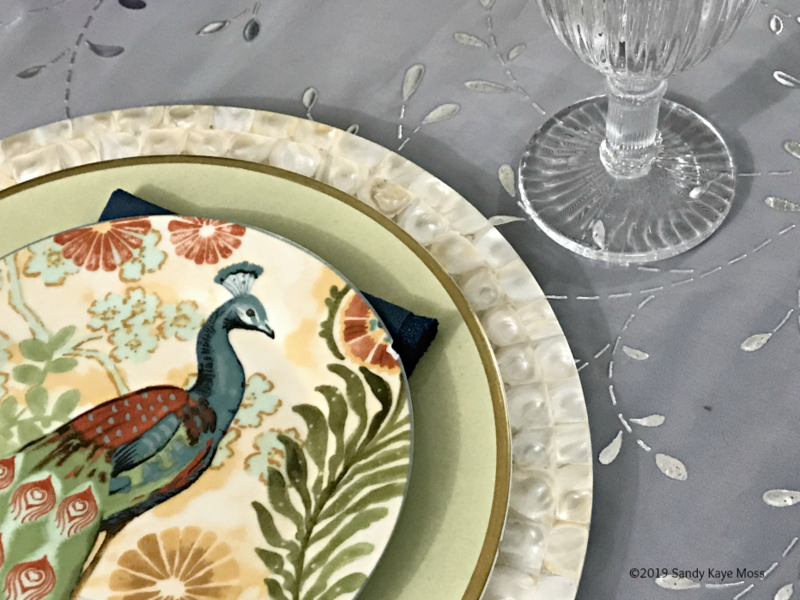 Let’s chat about those Peacock plates. We found those at TJ Maxx in Branson MO a few years ago. I have scoured the web for more. They must have been super popular because they are no where to be found! My favorite thing about these plates is they match hubbys’ grandmother’s dishes perfectly. Gosh, I feel like I’m forgetting something… OH!!! I am!!! Those cupcakes!! Oh my goodness those cupcakes. We have a new local bakery that is just the best!! The Gathering Bakery creates the most amazing desserts and yummy things! 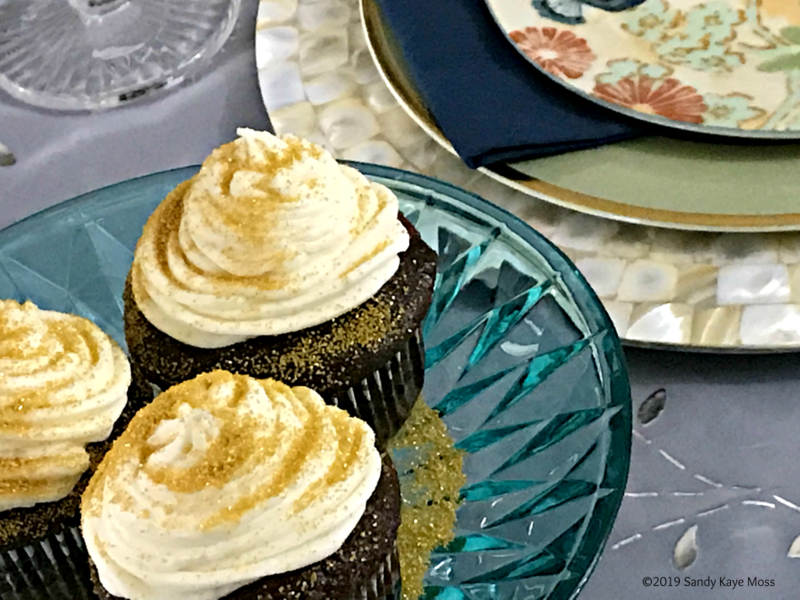 AND how cool is it that they had the perfect gold sugar for the cupcakes!! 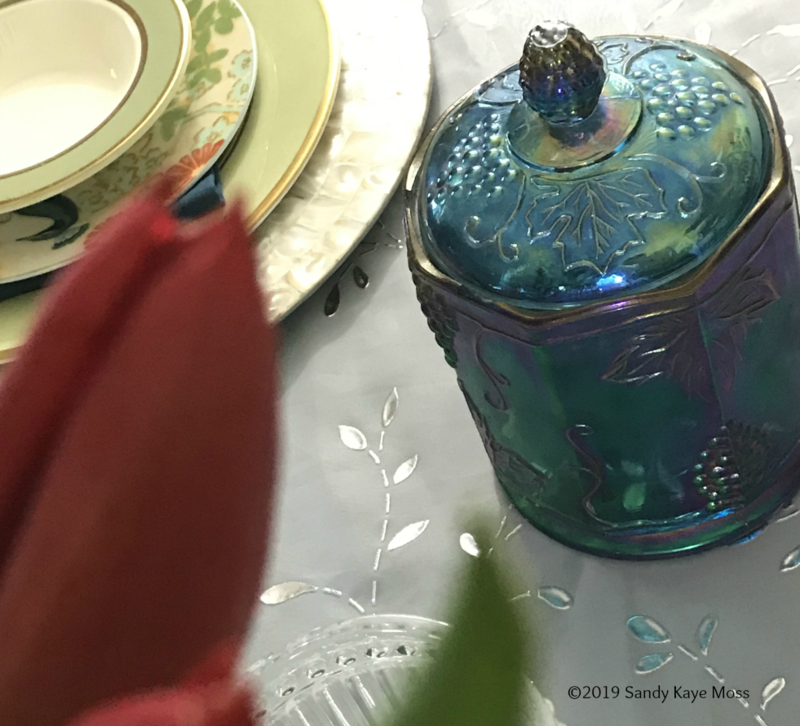 If I were to be totally honest… I would just create colorful tablescapes and vignettes and #alltheprettythings for a living. 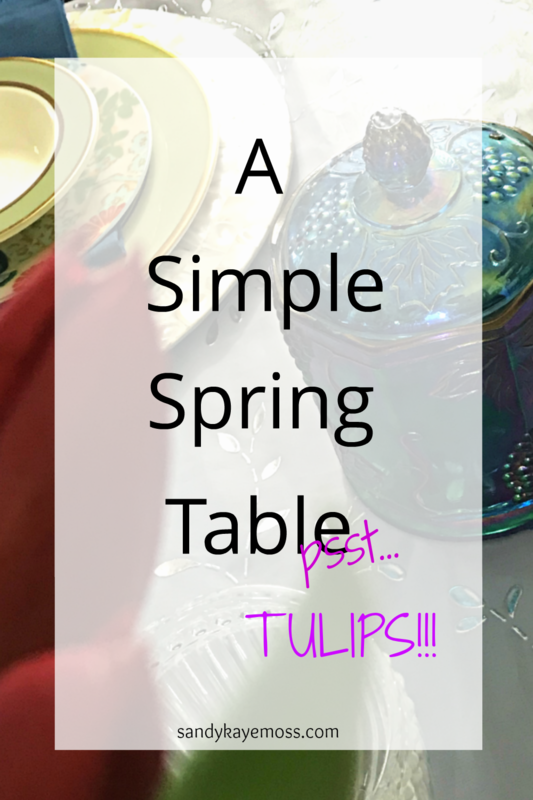 I think I’m just gonna make tablescapes a regular thing on the blog! 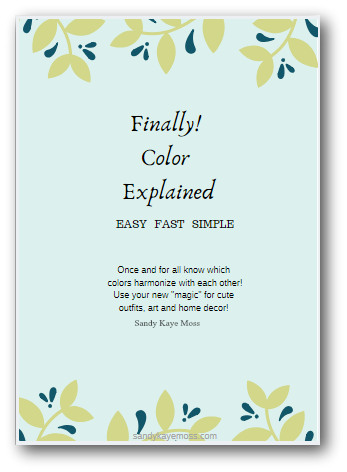 The easiest way to explore color is to just get your hands on it, which is exactly what tablescapes allow you to do. Next time you have a free afternoon… maybe a Sunday? 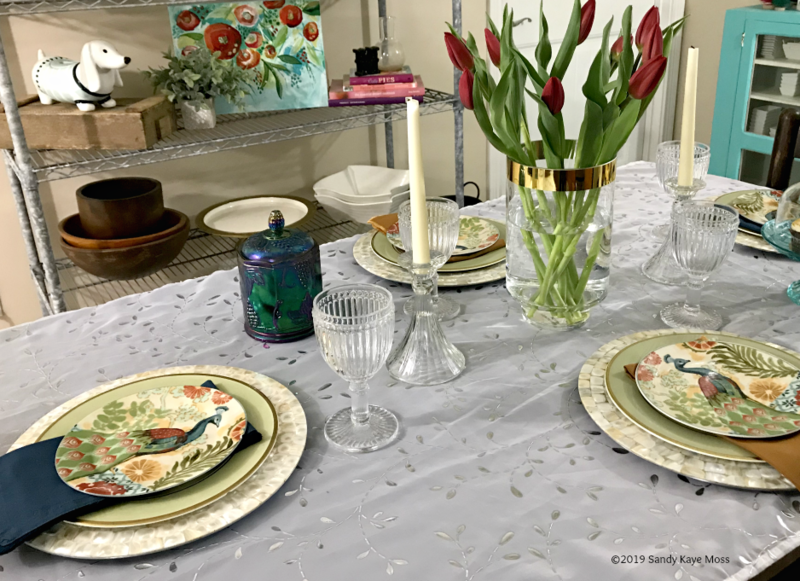 Pull out a dinner plate, salad plate… and any other things that are happy to sit on a table together and see what comes up!! You don’t have to do the entire table. Just pretend your seven years old again! This time, though, all the pretty things are FOR REAL!! You may become as addicted as I am!